Let us continue with Matrix Report and Joined Report in detail. Matrix report is used to summarize the data of 2 different types side by side. 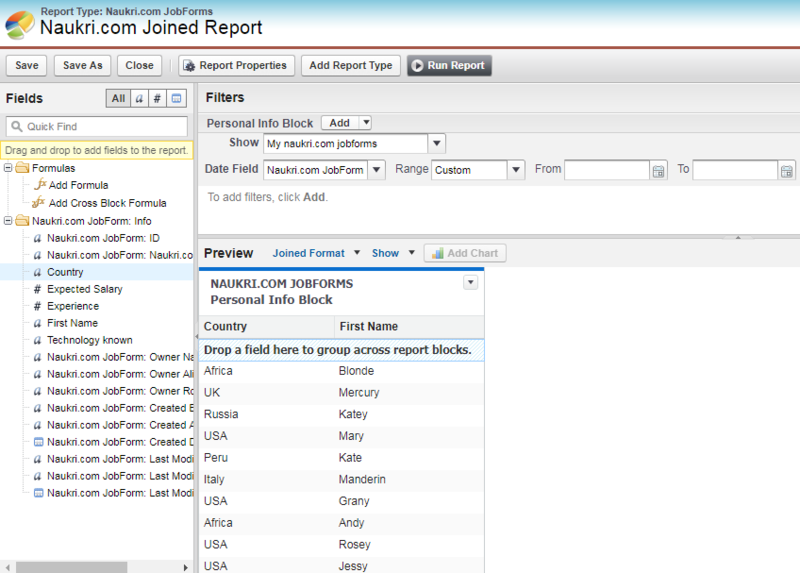 Joined report contains data from 2 or more blocks with different report types. It is used for checking the data dimension on one another. From a single object, it has relationship to various report types and can be combined to form a report. It helps users to group data by columns and rows. Principal report is considered as the first report added to the joined report. Various intersections in between data groups for checking the data in a table layout. Common fields are used to create blocks containing with data grouping. Chart and graph representation can be enabled in this report. It allows blocks of data which in return enables multiple views. This type of report is used in complex data summarizations. A user is allowed to create 5 block in a report. How To Add Chart to Summary Report ? How To Create Matrix Report ? 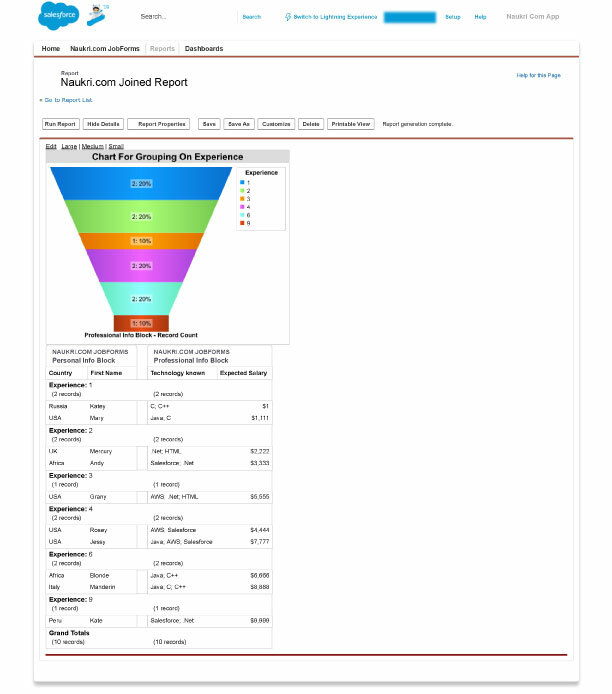 How To Create A Joined Report ? When We Use Joined Report ? 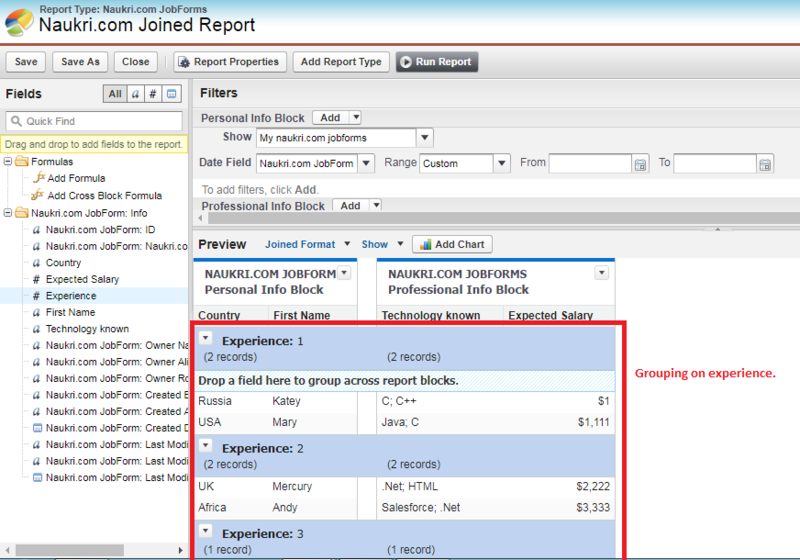 Matrix reports allows grouping records by both rows and columns. They are similar to summary report except that they permit 2 dimensional grouping. They help in comparing related totals with totals by rows and columns. vertically and by clients horizontally in a matrix report). We cannot show the columns in groups if they are logically related to each other having no connection with other columns. 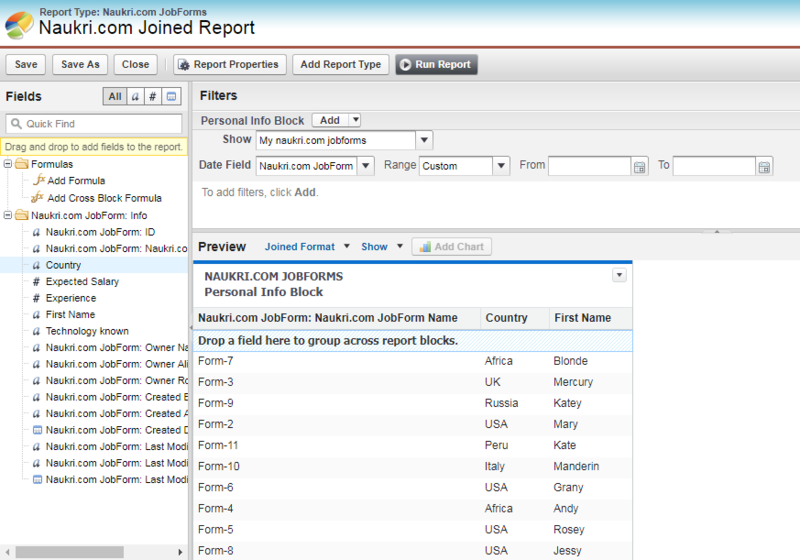 A joined report is a special type of report that contains multiple blocks within it. Each block holds related information. Each block can own unique columns, filters, and sort order. It can be used to group and show data from multiple objects in different views. By connecting objects together using relationship, we can show data from different objects in different blocks as well. 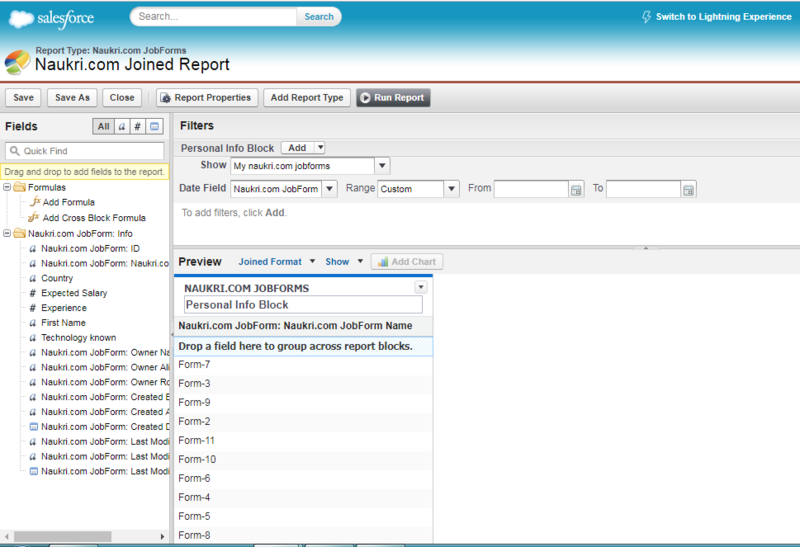 Login to Salesforce Org >> Click On “Reports” >> Select The Summary Report Already Created For The Object (Naukri.com Summary Report). Click on the “Add Chart” button which is enabled because of “Grouping” on “Country” already done. Select The “Vertical Bar Chart” as shown in below figure. Click on formatting “Tab” available, you can name the chart in “Chart Title” Field, “Size”, “Background Colour”, “Data Labels”, “Chart Position”, “Chart Size” >> Click on “Ok” to proceed and Then “Save” the Report. Result: The Summary Report with Chart is visible in the Report. Click the “Reports” button in the Tab Bar. Click On “New Report” button on the Tab Bar. After “Create” >> Save the Report For Identification Purpose as “Naukri.com Matrix Report” >> “Save”. Need to change the report format in the preview section for “Matrix Report” as shown in below figure Horizontally with “Country” grouping and Vertically With “Technology Known” >> and “Run Report”. Do not forget to “Save” the Report. We can even customise the matrix report with colour based on the Record Count shown below. For this, we need to select the “Show” in the Report area >> “Conditional Highlighting” from the drop down list. Then, we have screen popped up with “Conditional Highlighting”. Select the desired field >> Number as shown in the below figure. Result: The result for Colour Customisation Report is shown in the below figure. After “Create” >> Save the Report For Identification Purpose as “Naukri.com Joined Report” >> “Save”. Need to change the report format in the preview section as "Joined Format”. And, you can even change the name of the block or column just by selecting at the area specified in the below figure. Now, drag and drop the required fields for the “Personal Info Block” (ex: First Name, Country, etc.). You can even drag the “not required” fields back again whether they are pre-existing or customised. Personal Info Block altered by dragging the unnecessary fields to the left side of the Object Forms. For adding another block to the Report, drag and drop the required fields beside the block already created (eg, Personal Info Block). Note: You can create up to 5 blocks in a Report. Now, if you want for “Grouping The Data”. You need to select the “Field” on which grouping needs to be done and just drag and drop the field in the “Drop Zone” located Block area. Based on “Experience”, let us create the report. Drag the “Experience Field” and drop in the Drop Zone. Now, you can “Add Chart” for the joined Report as well. Now, “Save” the Report and “Run Report”. You can view the result in the below figure. We use joined report in the following two scenarios. If there is a need to show various columns in a group format together, where we have hundreds of fields in 1 object. If there is a need to show fields from different objects which are related with each other, and we want to see the data for comparison. In the next topics, we will discuss in detail about, “Dashboards” and “Using Report in Dashboard” in detail. Keep following us for more information on Salesforce Administration.